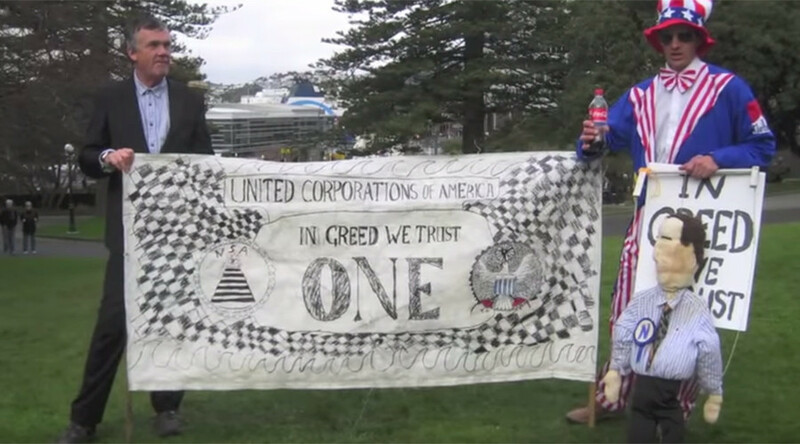 Thousands of demonstrators gathered throughout New Zealand to speak out against the Trans Pacific Partnership (TPP) trade deal on Saturday. Extra police were called in as protesters pushed through barriers in front of the country's parliament building. After being addressed by opposition politicians and campaigners, the demonstrators marched down Queen Street to the US Consulate building. Earlier this week, the US Consulate emailed American citizens living in New Zealand, advising them to avoid the march. “We urge citizens to avoid the protest march route as even demonstrations intended to be peaceful can turn confrontational. We remind citizens to always exercise caution when in the vicinity of any large gatherings, protests, or demonstrations,” the consulate wrote. Meanwhile, police in Wellington were called in to help security staff after a “small group tried to move up the steps of parliament before being stopped by police and security,” Wellington Police area commander Inspector Chris Bensemann said, as quoted by The New Zealand Herald. He added that officers were “able to contain” the protesters to the bottom of the steps. No arrests were made. In Nelson, more than 500 people marched through the city, holding up traffic and singing songs written for the protest. Flags representing the Nurses Union, Labour and Green parties, and the Public Service Association could be seen in the crowd. Large turnouts were also reported in Christchurch, Hamilton and Dunedin. Demonstrations took place in 21 cities and towns throughout the country, according to Radio New Zealand. The controversial TPP deal would involve the US and 11 other Asia-Pacific countries: Australia, Brunei, Canada, Chile, Japan, Malaysia, Mexico, New Zealand, Peru, Singapore, and Vietnam, leading to unfettered free trade and empowering big business in the region. Those against the deal have objected to the secrecy surrounding talks, and opponents in New Zealand say that many of the provisions will undermine the country's sovereignty, giving transnational corporations huge influence over the nation's laws and regulations. “Make the TPPA document available for public examination before you sign it – not after,” documentary filmmaker Bryan Bruce said, addressing protesters in Wellington. Four days of talks in Hawaii to finalize the deal stalled earlier this month after participating countries failed to reach an agreement. New Zealand Prime Minister John Key said last week that he expects it to be signed by the end of this year.